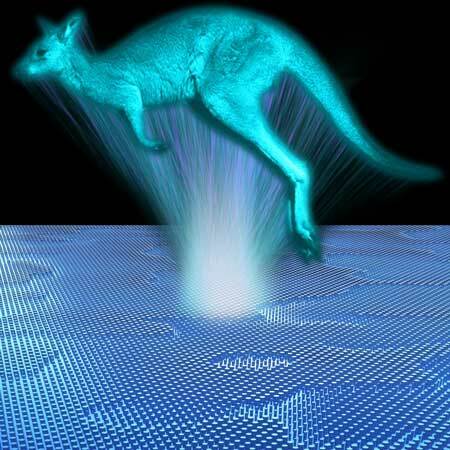 (Nanowerk News) Physicists from The Australian National University (ANU) have invented a tiny device that creates the highest quality holographic images ever achieved, opening the door to imaging technologies seen in science fiction movies such as Star Wars. Lead researcher Lei Wang said the team created complex holographic images in infrared with the invention that could be developed with industry (Optica, "Grayscale transparent metasurface holograms"). "As a child, I learned about the concept of holographic imaging from the Star Wars movies. It's really cool to be working on an invention that uses the principles of holography depicted in those movies," said Mr Wang, a PhD student at the ANU Research School of Physics and Engineering. "This new material is transparent, which means it loses minimal energy from the light, and it also does complex manipulations with light," said Dr Kruk from the ANU Research School of Physics and Engineering.